Hi! 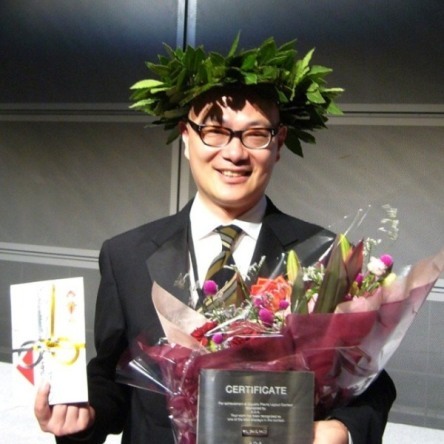 My name is Dave Chow who is from Hong Kong, China. I am 45 years old and I running a aquatic plant shop in Hong Kong with my wife. 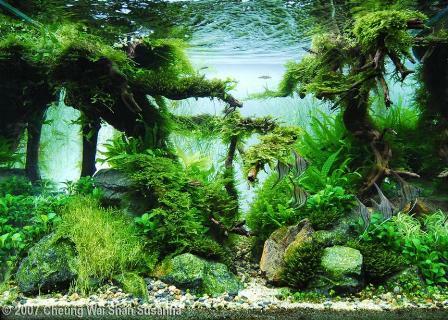 Basically, our shop is selling aquatic plants, aquarium products and provide aquascaping services etc. It is about 13 years ago since I buy a set of aquarium tank for my new home. I am handling about 30 to 40 aquariums right now and usually no limit of layouts but mostly my clients likes mountain scene. It is no doubt that is ADA Amazonia soil I will use in my aquariums! Yes, I have an experience for using heat cable under gravel. In my opinion that is useful for some circumstance and I will not use it in my tanks which for competition because the wire is hard ti hidden when photo taking LOL ! I am using mainly ADA and Seachem products because I find that they are useful and had significant effect. I used to 50% water change weekly and will not had water preparation. I am using de-chlorinator during water change and adding nitrifying bacteria after water change. Usually I recommend CO2 injection only during daylight is OK. Some aquariums I will use air pump at night especially fish population is dense and prevent oil film. Usually I am using ceramic rings for biological filtration and white foam for mechanical filtration. 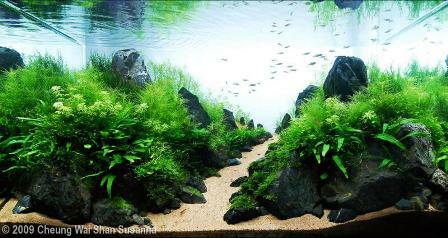 For new set up tank, I suggest to use active carbon, de-phosphate and de-nitrate filter media also. The circulation in the aquarium is so important! Usually I will not use additional pumps but will observe the outflow and inflow of the circulation and make sure that the current will run through the tank. It is not my often practice but I am only concern the NO3 level in the aquarium tank because it's the root of trouble if NO3 is high. It is hard to tell because different people had their personal interest. If they do it happy than do it! I will only introduce Amano shrimps as the first animals in new set up planted tank. It is also hard to tell because Zen philosophy is Zen philosophy, Iwagumi is Iwagumi and landscape is landscape, the aquascapers had his own interest to make the works they like, so it's good to see many different kind of layouts in different competition. This is true for creativity so that aquascaping can turn to true art! Nowadays many and many aquascaping contest are running by different country, i like to see this happen because it means this hobby is getting popular than ever. I think it will provide a chance for hobbyist and professional aquascaper to show off and is good to all! Yes, I like many aquascapers' work such as Masashi Ono from Japan, all CAU members etc. I like to drawing, jogging, hiking and plant keeping. You can find me on "Aqua Art 水木林森" on Facebook and also "www.aquaart.com.hk"
20. Any new ideas for the 2012? Yes! Many new ideas coming! Just wait and see! Well, Dave, the interview is ended. The Aquaexperience.it staff thanks you for the time you have dedicated to us. - 2nd place AGA Contest 2005 category "Extra Large"
- 1st place AGA Contest 2007 categoria "Large"
- 2nd place AGA 2007 category "Medium"
- 1st place AGA Contest 2008 category "Extra Large"
- 3rd place AGA Contest 2009 category "Large"